The "Star Trek" saga has always had a weakness for getting distracted by itself, and "Star Trek: Generations," the seventh film installment, is undone by its narcissism. Here is a movie so concerned with in-jokes and updates for Trekkers that it can barely tear itself away long enough to tell a story. From the weight and attention given to the transfer of command on the Starship Enterprise, you'd think a millennium was ending - which is, by the end of the film, how it feels. 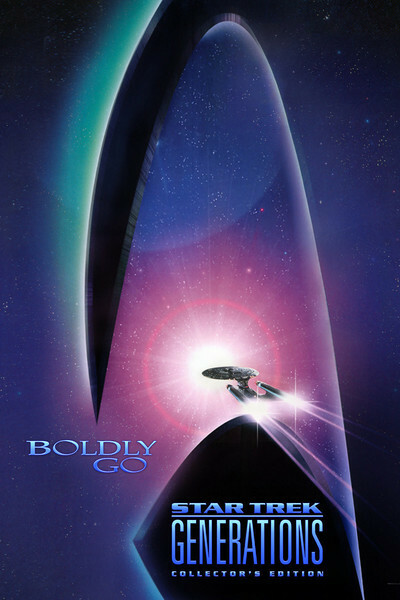 The movie opens during a maiden run for the Enterprise B; plans call for it to take a little dash around the solar system with some reporters on board. But then a call for help is received, and there's polite jockeying for position between the newly appointed Capt. Picard (Patrick Stewart) and the just-retired Capt. Kirk (William Shatner). Kirk is obviously better-equipped to handle the crisis, but alas the ship itself is unequipped, unmanned and unready for an emergency. The emergency involves a free-floating coil of space energy, which has captured two ships in what I think was called its Gravametric Field. ("Star Trek" has never been shy of polysyllabic pseudoscientific gobbledygook, and "Generation" bathes in it; the victims' "life signs are phasing in and out of our space-time continuum"!) One of the survivors is the intense Dr. Soran (Malcolm McDowell), of the El Aurian species, who insists he must get back to the ship. It explodes in the Nexus force field, however, and the story leaps forward 78 years. Capt. Picard now finds himself on a rescue mission to an observatory where Dr. Soran is again rescued, and again insists he must return, and lo, here comes the Nexus again, along with an explanation by Guinan (Whoopi Goldberg), the Enterprise's resident mystic, who says that those caught in the Nexus are "bathed in joy." We learn that Soran will do anything for that joy, including destroying stars and their planets with millions of inhabitants, just to nudge the Nexus a little out of its way. His calculations are astonishingly precise: By using Solar Probes to destroy an entire solar system, he can steer the Nexus so that it brushes right above a rickety steel platform he has constructed in an alien desert, and he can sort of leap up into it and be absorbed in joy. Meanwhile, there is a lot happening aboard the Enterprise, which has a way of being constantly buffeted by force fields and Gravametric explosions ex cept when Quietly Meaningful Dialogue is being exchanged; at such times the ship is perfectly still. I would estimate that the command deck is being buffeted, filled with smoke, and showered with electri cal sparks, a good third of the time, with the computers all flashing superfluous "Alert!" warnings, just when you want them to tell you something helpful. The "Star Trek" series has always specialized in hilariously klutzy hardware, but outdoes itself this time; the TV cameramen in the opening scenes wear little lights on their heads which illuminate only the centers of the faces of their subjects (surely by the 21st century Man, even Newsman, will not have forgotten how to light a whole face?). And the computer controls aboard the starship now seem modeled on the multiple-choice cash registers at McDonald's, where you just push the Big Mac button instead of needing to know how much it costs. The running joke this time involves Lt. Cmdr. Data (Brent Spiner), a computerized android who tries out a tricky emotion chip and suddenly understands jokes he was told years ago. This notion could have led to some funny scenes, but doesn't, and the scene where Data shorts out (or his chip crashes, or something) is acted and directed so uncertainly it is positively puzzling. The "Star Trek" movies and TV shows always consider at least one Big Important Human Question, and this time it has to do with the Choice Between Happiness and Reality. When you get sucked into the Nexus, see, you think you are living once again through the most joyous days of your life. This would be great, except you kinda know you're not, and so both Capt. Kirk and Capt. Picard must choose between the hazards of reality and the seductive dream world. There's a lesson here somewhere. Hell, there's a lesson here everywhere. I will not be giving away any secrets if I reveal that Capt. Kirk dies in the course of the movie. Countless Trekkers have solemnly informed me of this fact for months, if not years. Leave it to Kirk to be discontent with just one death scene, however. Kirk's first death is a very long silence, but he has dialogue for his second one. Oh, my, yes he does. And slips away so subtly I was waiting for more. I, for one, will miss him. There is something endearing about the "Star Trek" world, even down to and including its curious tradition that the even-numbered movies tend to be better than the odd-numbered ones. And it's fun to hear the obligatory dialogue one more time (my favorite, always said by someone watching the giant view screen, where an unearthly sight has appeared: "What . . . the . . . hell . . . is . . . THAT?"). "Star Trek" seems to cross the props of science fiction with the ideas of Westerns. Watching the fate of millions being settled by an old-fashioned fistfight on a rickety steel bridge (intercut with closeups of the bolts popping loose and the structure sagging ominously), I was almost amused by the shabby storytelling. Why doesn't more movie science fiction have the originality and imagination of its print origins? In "Stargate," the alien god Ra was able to travel the universe, yet still needed slaves to build his pyramids. In "Star Trek: Generations," the starship can go boldly where no one has gone before, but the screenwriters can only do vice versa.